Simple Cooking Recipes in Zelda BOTW, Nintendo Switch — Kelleher Bros.
With all that has to done around Hyrule these days, who has time to worry about what to make for dinner? There's so many recipes out there and so many ingredients to choose from, how's a Hylian champion on the move ever expected to master the culinary arts? Well worry not, my skinny elfish friend, I've got some great 5-ingredient recipes that are easy to learn and simple to remember. You'll never go hungry again! Zelda: Breath of the Wild has a surprisingly robust camp cooking simulator and a seemingly endless variety of ingredients to work with. But when the world needs saving, this can get a little daunting. Let's breakdown the less intuitive aspects of this stuff, so we know what we're talking about. There's a lot of food ingredients that include a descriptor at the beginning of the item's name, and these prefixes denote the special benefits the item with add to the final product. You'll see descriptions like "Swift Carrot" and "Endura Carrot", both of which add different bonuses. There's the regular old Hylian Bass, which has no added effect, versus the Hearty Bass and Staminoka Bass that do. Perhaps the best example of these descriptions is the game's many varieties of mushrooms. Just compare the standard 'do nothing special' Hylian Shroom to the Stamella Shroom, Endura Shroom, Razorshroom, Iron Shroom, Rushroom, Zapschroom, Chill Shroom, Sunshroom, and Silent Shroom—all of which imbue food dishes with added benefits. Reading each item's description within the game's Inventory menu can tell you definitively what effect (if any) an ingredient will add to a dish. Beyond that, you need to know the possible effects your recipe can have, so I've listed these below. Hearty = Gives Extra Hearts! Cooking multiple ingredients with the same added effect will boost the stat bonus the dish provides. So cooking five Spicy Peppers together gives you Cold Resistance for a longer period of time than cooking just two. However, please note that food (and elixirs too, for that matter) can only provide one special effect at a time. So cooking a Staminoka Bass (stamina) with Rushrooms (speed) does not result in food that restores stamina and increases your speed of movement. It just gives you a normal Fish and Mushroom Skewer with no added effects. Aim for one effect at a time! Cooking in BOTW will allow you to make two kinds of consumable products: Food and Elixirs. While the ingredients that can go into food is pretty straightforward, I think it's worth noting here that elixirs are only made by cooking critters (insects, lizards, & frogs) and monster parts (Chuchu Jelly, fangs, horns, & guts). All that Blue Chuchu Jelly you've collected is specifically for making elixirs. Just add an effect-imbuing critter or two to some Chuchu Jellies to make whatever elixir you need. 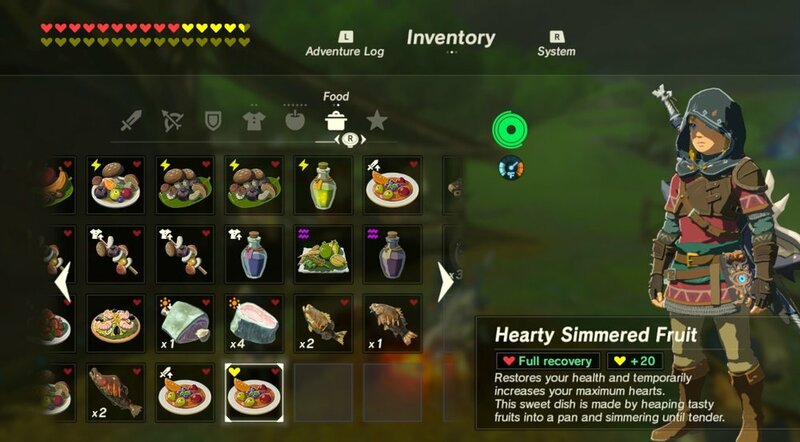 Players starting out in BOTW should find ingredients with the descriptor of “Hearty” to be the most useful. Cooking with Hearty ingredients into your dishes generally results in food that not only restores your full health, but even adds extra hearts beyond your current level. (The extra hearts are displayed in yellow, and once you lose them they don't come back.) This is super helpful for surviving battles early on in the game when you don’t have very good armor and your rusty f*#%ing sword keeps breaking. The King of Hearty ingredients also happens to be the King of Fruits: the spiky-husked, odorous orb known as Durian. Cooking five Hearty Durians together produces a dish that will fully restore your health and provides 20 extra hearts on top! Twenty EXTRA! That's insane. Durians can be found in tropical areas, especially the near Faron Tower and Bronas Forest. Grab as many as you can find! You're not likely to see many durians early on in the game, so in the meantime you'll likely want to cook with Hearty Bass, Hearty Truffle, and Hearty Beats. I've found that a couple Hearty Beats combined with regular meat, eggs, or fish, makes for a good full-recovery-plus-a-little-extra dish. Just make sure not to mix your Hearty ingredients with items carrying different added effects—doing so will produce merely normal food without the benefit of additional hearts. 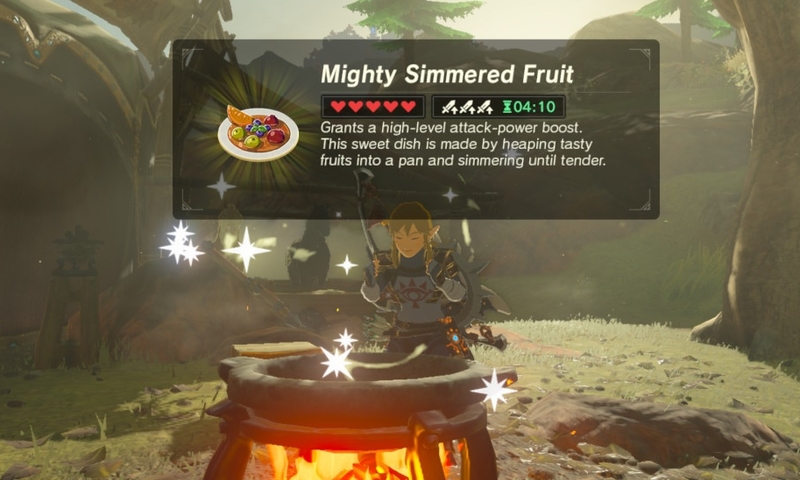 There's a reason why the Yiga Clan loves Mighty Bananas, this fruit will get you PUMPED! When a big fight is on the horizon—when it's "on like Donkey Kong", if you will—you need a pre-battle meal filled with vitamin B6 and potassium...for some reason. Cooking up a pot full of Mighty Bananas will greatly boost your attack power, allowing you to make ever hit count. Especially when you're about to tangle with a Lynel or Stone Talus, this buff really helps. Mighty Bananas can be found in tropical areas, especially southeast of Faron Tower, on the bluffs near Lakeside Stable. Assassins from the Yiga Clan will drop bananas whenever they are bested in combat, and when you infiltrate the Yiga Clan's hideout, there's a great many bananas to be grabbed. So go Bananas! Ever been just two handholds away from cresting a mountain cliff, only to have your stamina wheel run out mid-climb, loose your grip on the rock face, and plummet straight down to your certain doom? Whether it's climbing, taming wild horses, or just wanting to keep your spin-attack just whirling and whirling, there will be plenty of times that Link's stamina wheel could use a recharge. The easiest recipe to solve this problem is a simple mushroom skewer: five Stamella Shrooms to be precise. Using this same principle, you can make several mushroom skewers with different effects. Want to increase your Stealth stats? Cook five Silent Shrooms. Want increase your Defense? Cook five Iron Shrooms. Speed boost? Five Rushrooms. And so on. Electric Shock Resistance is pretty damn important in BOTW, which you'll learn the first time you encounter one of those goddamn electric bats (Electric Keese). To avoid be electrocuted until dead by an otherwise trivial nuisance of a vermin, you'd best stock up on something to make you more shock-proof. My favorite recipe for this a combination of Voltfruit (x 2) and Zapshroom (x3). Both Voltfruit and Zapshroom can be found in the Gerudo Desert. Voltfruit can easily be spotted flowering on top of cacti there. The in-game tips tell me that Zapshrooms can also be found under trees, but apparently only during a thunderstorm. 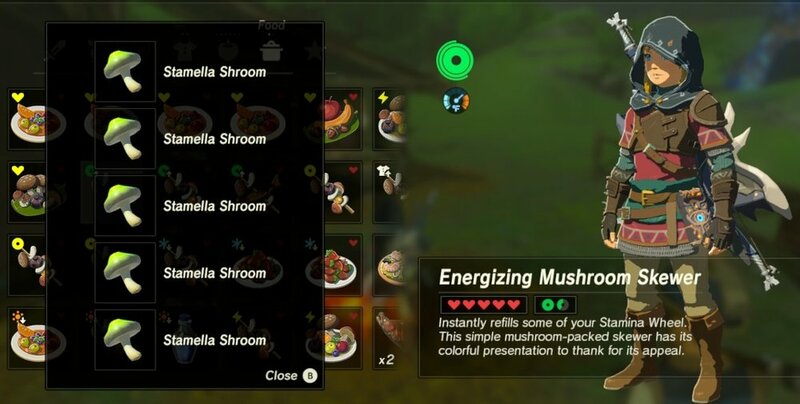 It's worth noting that simply using all Voltfruit or all Zapshroom in your recipe would probably work just as well. And you could even through in another electro ingredient, like Electric Safflina, and be fine too. I'm fairly certain that the real difference is going to come from how many electro ingredients you include, as opposed to which ones you pick, though I could be wrong there. And that's about it. I hope these tips are enough to kickstart your culinary adventures! Or, at the very least, I hope this makes the prospect of cooking in BOTW a little less tedious. I know it can be annoying when a restaurant expects you to cook your own food, let alone Nintendo suddenly asking the same. Bon appétit!